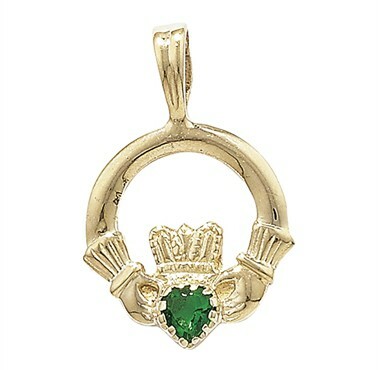 Green has always been associated with the Irish, so it seems only right to offer the traditional Claddagh design pendant with an emerald green crystal. Features the hands, symbollising friendship, the heart symbolising love and the crown for loyalty. All created in 9ct gold and complete with a gold chain. Actual Size: 1.9cm.